A Minuteman III intercontinental ballistic missile engine is loaded into a truck in 2000 for transport to another building for refurbishment at Hill Air Force Base in Utah. Nuclear weapons are explosive devices that utilize the processes of fission and fusion to release nuclear energy. An individual nuclear device may have an explosive force equivalent to millions of tons (megatons) of trinitrotoluene (TNT, the chemical explosive traditionally used for such comparisons), more than enough to completely destroy a large city. The destructive power of nuclear weapons derives from the core of the atom, the nucleus. One type of nuclear weapon, the fission bomb, uses the energy released when nuclei of heavy elements, such as plutonium, fission or split apart. A second even more powerful type of nuclear weapon, the fusion or hydrogen bomb, uses the energy released when nuclei of hydrogen are forced to fuse (join together). Nuclear devices have been fashioned into weapons of many shapes with many purposes. Bombs can be dropped from airplanes; warheads can be delivered by missiles launched from land, air, or sea; artillery shells can be fired from cannons; mines can be placed on the land and in the sea. Some nuclear weapons are small enough to destroy only a portion of a battlefield; others, as already mentioned, are large enough to destroy entire cities and more. Unlike chemical explosives, nuclear weapons have had no peacetime uses, although in the 1950s the U.S. government briefly considered using them to blast artificial harbors in the Alaskan coastline. They are possessed by a number of nations, including the United States, France, Great Britain, China, India, Israel, Pakistan, and the Russian Federation along with several former Soviet Republics. Iran and North Korea, among other nations, are interested in building them. Since nuclear weapons were invented during World War II, they have been used only twice, both times against cities in Japan by the United States. Development of nuclear weapons. German physicist Albert Einstein (1879–1955) did not know it at the time, but when he published his Special Theory of Relativity in 1905 he provided the world with the basic information needed to build nuclear weapons. Einstein said that the amount of matter of an object (i.e., its mass) is equivalent to a specific amount of energy. The exact amount of energy in an object equals its mass multiplied by the square of the speed of light. The speed of light is large—186,282 miles per second (300,000 km/sec)—so even a small piece of matter contains a vast amount of energy. A baseball-size sample of uranium-235, for example, can explode with as much energy as 20,000 tons of TNT—and this involves the conversion of only a tiny fraction of the uranium's mass into energy. One pound of explosive material in a fission weapon is approximately 100,000 times as powerful as one pound of TNT. As World War II approached, two German chemists, Fritz Strassmann (1902–1980) and Otto Hahn (1879–1968), pointed a stream of neutrons at a sample of uranium and succeeded in splitting the nuclei of some of its atoms. This splitting of nuclei is termed nuclear fission. The energy released through nuclear fission was the source of power for the first atomic bomb, which was built in the United States by a large team of scientists led by U.S. physicist J. Oppenheimer (1904–1967). This secret research and development program was termed the Manhattan Project. The first atomic bomb was detonated in a test at Alamogordo, New Mexico, on July 16, 1945. Three weeks later, on August 6, a bomber named Enola Gay dropped a four-ton atomic bomb containing 12 lb (5.4 kg) of uranium-235 on the Japanese city of Hiroshima. Seventy thousand people died as a direct result of the blast. Within two months, nearly twice that many were dead from blast injuries and radiation. Three days later, on August 9, a bomb containing several pounds of plutonium was dropped on Nagasaki. Thirty thousand people died in the seconds following the explosion, and more later. The Japanese surrendered the next day, ending World War II. These first nuclear weapons were atomic bombs or A-bombs. They depended on the energy produced by nuclear fission for their destructive power. However, scientists like U.S. physicist Edward Teller (1908–) knew even before the first atomic bomb exploded that the fission weapons could be used to create an even more powerful explosive, now called a thermonuclear device, hydrogen bomb, or H-bomb. This weapon gets it power from the energy released when atoms of the hydrogen isotopes deuterium or tritium are forced together, a process called nuclear fusion. Starting a nuclear fusion reaction is even more complicated than setting off a fission atomic bomb; it requires such heat to initiate it that a fission bomb is used as a detonator to explode the fusion bomb. The United States tested the first hydrogen bomb on November 1, 1952. It exploded with the force of 10.4 megatons (millions of tons of TNT equivalent). Three years later, the Soviet Union exploded a similar device. For the next 40 years, the United States, with its allies, and the former Soviet Union, with its allies, raced to build more nuclear weapons, with each side producing tens of thousands. The end of the cold war and the breakup of the Soviet Union in the early 1990s led to the elimination of a significant number of nuclear weapons; however, the U.S. and Russia still possess many thousands of nuclear weapons. The physics and mechanics of nuclear weapons. Conventional, chemical explosives get their power from the rapid rearrangement of chemical bonds, the links between atoms made by sharing electrons. In chemical explosives, atoms dissociate from other atoms and form new associations; this releases energy, but the atoms themselves do not change. Nuclear weapons are based on an entirely different principle. They derive their explosive power from changes in the structure of the atom itself, specifically, in the core of the atom, its nucleus. Atomic bombs use the energy released when nuclei of heavy elements split apart or fission. Uranium and plutonium are the two elements that can be used as fuel for this type of weapon. When nuclei of these atoms are struck with rapidly moving neutrons, they are broken into two pieces nearly equal in size. They also release more neutrons, which split more nuclei. This is called a chain reaction. If enough atomic nuclei split they will release enough neutrons to ensure that all the nuclei of all the atoms in a sample will be split. Enormous amounts of energy are then released in a fraction of a second. This release of energy is the power behind the atomic bomb. Uranium and plutonium are termed fissile materials because they can support a fission chain reaction if enough material is concentrated in one place. Too small a sample would not generate enough neutrons to keep the fission process going; for example, a one-pound (.45-kg) sample of uranium-235, a sample about the size of a ping-pong ball, is not large enough to support a chain reaction. The atomic bombs used in World War II proved that 12 or so pounds (about 5.5 kg) of fissile material, larger than a ping-pong ball but still small enough to fit into your hand, is enough to maintain a chain reaction. The smallest amount of material that can support a chain reaction is called the critical mass. The instant enough bomb material is gathered together into a critical mass, a chain reaction begins. (At higher density, less mass is required.) This means that fissile material cannot be assembled in a critical mass until it is meant to explode. Therefore, the sample of uranium or plutonium in an atomic bomb is separated into several pieces, each of which is below critical mass. To set the bomb off, the separated pieces of bomb material are rammed together to create a critical mass. One design for creating a critical mass involves firing a subcritical "bullet" of fissile material into a subcritical "target" of fissile material. Together, the bullet and the target create a critical mass that starts a chain reaction leading to a nuclear explosion. A different design was used to detonate the bomb dropped on Nagasaki. Plutonium was stored in one large but subcritical mass. It was compressed to a critical density by means of surrounding chemical explosives. When the chemical explosive detonated, the blast forced the bomb material into a density that reached criticality. In either type of design, once criticality is reached the explosion follows in a millionth of a second. In order for nuclear fission to occur, a bomb must use heavy atoms for fuel. Heavy atoms have many nucleons—neutrons and protons—in their nuclei. When these heavy nuclei split apart they release energy (and neutrons, which may cause nearby heavy nuclei to split apart also). Another more powerful type of nuclear weapon uses forms of hydrogen as fuel. Hydrogen has few subatomic particles in its nuclei—usually only a proton, but the isotope deuterium has a proton plus a neutron, while the isotope tritium has a proton plus two neutrons. Instead of being split apart, these light atomic nuclei are forced together in high-speed collisions, a process called nuclear fusion. Energy is released when hydrogen nuclei fuse, forming helium. Fusion only occurs at temperatures of millions of degrees, such as exist in the hearts of stars. (The sun and other stars generate their energy primarily by fusing hydrogen into helium.) On Earth only an atomic bomb can raise kilograms of material to such a temperature, which is why atomic bombs are used as detonators for hydrogen fusion bombs. Because hydrogen is lighter than uranium, more hydrogen atoms fit into a sample of the same weight. Thus, even though one fusion reaction releases less energy than one fission reaction, more hydrogen than uranium atoms can be packed into a nuclear weapon and many more fusion reactions can take place in the weapon than fission reactions can take place in a fission bomb. Fusion weapons, therefore, produce bigger explosions than fission weapons of the same physical bulk. By 1954, a new feature had been added to the hydrogen bomb to create an even more dangerous weapon. Like earlier hydrogen bombs, this weapon was detonated with the explosion of an atomic or fission weapon. This raised temperatures enough to cause the hydrogen atoms in the bomb to fuse and explode like a regular hydrogen bomb. The designers also enclosed this new bomb in a shell of uranium-238. Neutrons released from the fusion of hydrogen caused the uranium-238 in the surrounding jacket to undergo fission, adding to the power of the blast. This new device was, in effect, a fission-fusion-fission bomb. The power or "yield" of a nuclear weapon is expressed in terms of how much TNT would be required to equal the weapon's blast. Units of kilotons (thousands of tons) and megatons (millions of tons) of TNT are used to describe nuclear blasts. The shock wave produced when a nuclear weapon explodes creates a front of moving air more powerful than any produced by a natural storm. Destructive winds follow the front of displaced air, causing more damage to objects in their path. Many nuclear weapons are designed to be detonated high above their targets to take advantage of this shock effect. The more powerful the bomb, the higher in the sky it will be detonated. The fission bombs dropped on Japan (Hiroshima, 13.5 kilotons; Nagasaki, 22 kilotons) exploded between 1,500 and 2,000 feet (458–610 m) above their targets. A bomb with the power of 10 megatons is capable of destroying most houses within a distance of more than 10 miles from the blast site. Unlike conventional explosives, nuclear devices can also release significant amounts of radioactivity and pulses of electromagnetic energy. Radioactivity is the release of fast particles and high-energy photons from unstable atomic nuclei. Besides the greater explosive power of nuclear weapons, radiation is the primary feature that most clearly distinguishes chemical from nuclear explosions. Radiation can kill outright at high doses and cause illnesses, including cancer, at lower doses. The initial burst of radiation during a nuclear explosion is made up of X rays, gamma rays, and neutrons. The energy of this radiation is so high that it can often penetrate buildings. Radioactive materials then contaminate the explosion site and often enter the atmosphere where they can travel thousands of miles before falling back to earth. This source of radiation is called radioactive fallout. Radioactive fallout can harm living things for years following a nuclear explosion. Fission bombs and fission-fusion-fission bombs produce more fallout than hydrogen bombs because the fusion of hydrogen atoms generates less radioactive byproducts than does fission of uranium or plutonium. Electromagnetic pulses (EMPs) are also produced by nuclear weapons that are exploded at high altitudes, and are caused by the interaction of radiation from the explosion with electrons in the atmosphere and with the Earth's magnetic field. EMPs are essentially powerful radio waves that can destroy many electronic circuits. The effects of fires and destruction following a largescale nuclear war could even change the climate of the planet. In 1983 a group of scientists, including U.S. astronomer Carl Sagan (1934–1996), published the "nuclear winter" theory, which suggested that particles of smoke and dust produced by fires caused by many nuclear explosions would, for a time, block the Sun's rays from reaching the surface of Earth. This, in turn, would reduce temperatures and change wind patterns and ocean currents. These climatic changes, according to the theory, could destroy crops and lead to the death by famine of many more animals and humans than were killed outright by nuclear explosions. Some scientists have challenged these predictions, but others, including some United States government agencies, support them. On the other hand, there is no controversy about whether a large-scale nuclear war could kill hundreds of millions of people and imperil the future of modern civilization, even apart from nuclear winter effects. Modern nuclear weapons. Today nuclear weapons are built in many sizes and shapes not available in the 1940s and 1950s, and are designed for use against many different types of military and civilian targets. Some weapons are less powerful than 1,000 tons of TNT, while others have the explosive force of millions of tons of TNT. Small nuclear shells can be fired from cannons. 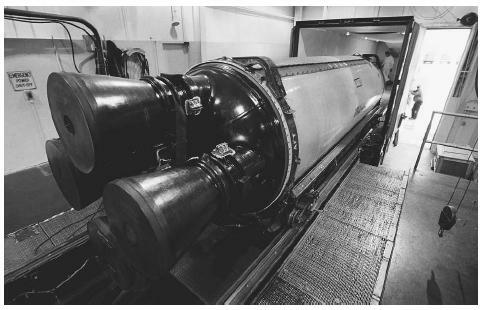 Nuclear warheads mounted on missiles can be launched from land-based silos, ships, submarines, trains, and large wheeled vehicles. Several warheads can be fitted into one missile and directed to different targets in the same geographic area upon reentry into the Earth's atmosphere. These multiple independently-targeted reentry vehicles (MIRVs) can release 10 or so individual nuclear warheads far above their targets, making enemy interception more difficult and increasing the deadliness of each individual missile. In general, nuclear weapons with "low" yields (in the kiloton, rather than the megaton, range) are termed "tactical," and are designed to be used in battle situations against specific military targets, such as a concentration of enemy troops or tanks, a naval vessel, or the like. These weapons are termed tactical because the word tactics, in military jargon, refers to the relatively small-scale maneuvers undertaken to win particular battles. Larger nuclear weapons are classed as "strategic," because the word strategy, again in military jargon, refers to the large-scale maneuvers undertaken to win whole wars. Strategic nuclear weapons are targeted mostly at cities and at other nuclear weapons, and are generally designed to be dropped by bombers or launched on ballistic missiles; tactical nuclear weapons are delivered by smaller devices over shorter distances. However, one nation's "tactical" warhead may be another's "strategic" warhead: Russia, for example, maintains that U.S. tactical warheads in Western Europe are in fact strategic warheads, because they can strike targets inside Russia itself, while Russian "tactical" warheads in the same arena cannot strike the U.S. heartland. In the summer of 2002, the George W. Bush administration sought and received permission from Congress to design a new class of nuclear weapons: "mini-nukes" are relatively low-yield tactical nuclear weapons for use against underground bunkers and other small battlefield targets. Also in 2002, the U.S. military—according to a secret Pentagon document leaked to the press—drew up an official set of contingency plans for attacking seven countries with nuclear weapons (China, Russia, Iraq, North Korea, Iran, Libya and Syria). Advocates of these new weapons point to the uniquely powerful, compact "punch" that can be delivered by a nuclear weapon; critics argue that even a small nuclear weapon may cause many civilian casualties, and, more important, that actual use of a nuclear weapon of any size would break the taboo on such use that has held since the end of World War II, making the use of larger, more destructive nuclear weapons more likely in future conflicts. Some analysts stressed that the Pentagon's explicit willingness to use nuclear weapons in a "first-use" fashion, that is, in response to "unexpected military situations" not involving attack on U.S. forces by nuclear weapons, or to use them on targets (e.g., deep bunkers) resistant to conventional explosives signaled a major shift in United States nuclear use doctrine. Even the ability of nuclear weapons to release radioactivity has been exploited to create different types of weapons. "Clean bombs" are weapons designed to produce as little radioactive fallout as possible. A hydrogen bomb without a uranium jacket would produce relatively little radioactive contamination, for example. A "dirty bomb" could just as easily be built, using materials that contribute to radioactive fallout. Such weapons could also be detonated near Earth's surface to increase the amount of material that could contribute to radioactive fallout. "Neutron" bombs have been designed to shower battle fields with deadly neutrons that can penetrate buildings and armored vehicles without destroying them. Any people exposed to the neutrons, however, would die. (Neutron bombs also destroy with blast effects, but their deadly radiation zones extend far beyond the site of their explosions). The United States and Russia signed a Strategic Arms Reduction Treaty in 1993 to eliminate two thirds of their nuclear warheads in 10 years. By 1995, nearly 2,500 nuclear warheads had been removed from bombers and missiles in the two countries, according to U.S. government officials. ("Elimination," in this context, does not necessarily mean dismantlement; many of the weapons that have been "eliminated" by the treaty have been put in storage.) Although thousands of nuclear weapons still remain in the hands of many different governments, especially those of the U.S. and the Russian Federation, recent diplomatic trends have at least helped to lower the number of nuclear weapons in the world. This has caused many people to assume that the danger of nuclear weapons evaporated with the end of the Cold War. However, the number of nations possessing nuclear weapons continues to increase, and the possibility of nuclear weapons being used against human beings for the first time since World War II may be larger than ever. In May 1995, more than 170 members of the United Nations agreed to permanently extend the Nuclear Non-Proliferation Treaty, first signed in 1960. Under the terms of the treaty, the five major countries with nuclear weapons—the United States, Britain, France, Russia, and China—agreed to commit themselves to eliminating their arsenals as an "ultimate" goal. The other 165 signatory nations agree not to acquire nuclear weapons. Israel, which is believed to possess nuclear weapons (but officially denies doing so), did not sign the treaty. Two other nuclear powers also refused to renounce nuclear weapons: India and Pakistan, each of which probably possess several dozen nuclear weapons, have fought a number of border wars in recent decades, and in 2002 came close, as many observers thought, to fighting a nuclear war. As of 2003, North Korea had reactivated its nuclear-weapons-material production facilities and was engaged in a tense diplomatic standoff with the United States, which insisted that North Korea abandon its nuclear-weapons program. Rhodes, Richard. Dark Sun: The Making of the Hydrogen Bomb (Sloan Technology Series). New York: Simon & Schuster, 1995. Sagan, Scott D. and Kenneth N. Waltz. The Spread of Nuclear Weapons: A Debate Renewed, 2nd ed. W. W. Norton & Co., 2003. Walmer, Max. An Illustrated Guide to Strategic Weapons. New York: Prentice Hall Press, 1988. "U.S. Has Nuclear Hit List." BBC News. March 2, 2002. < http://news.bbc.co.uk/2/hi/americas/1864173.stm > (Feb. 26, 2003).